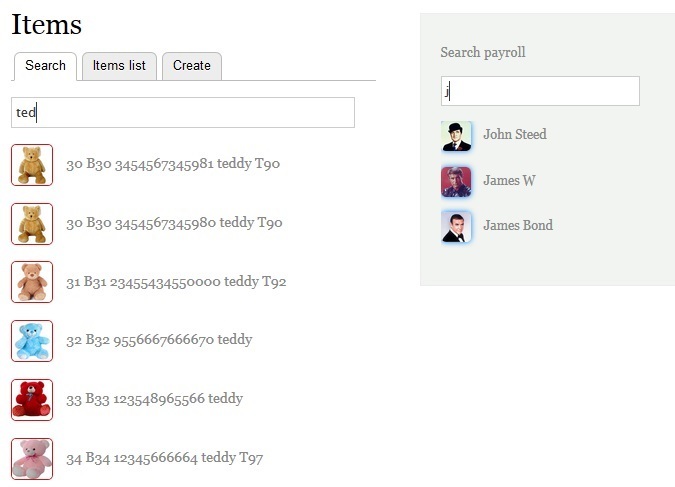 This script will help display the results of a search by keyword instantly via an ajax call. It can be applied to various search types. From user point of view it creates a good user experience and efficient working flow. For instance we apply this search in products and services module and payroll module to quickly find the data to be reviewed or edited. The search form is very simple and is made from a text field and <div> to display the results. We do not need to "submit" the form as the search results are returned by an ajax call. The form is located in mymodule/src/From. You can notice that the library MyModule.autocomplete is attached to the search box. Let's create the library script now. We include some class properties that will be defined in a file MyModule.css included in the library declaration above. The result is returned as a json format from the controller but will be displayed as html format in the browser. The controller function (i.e autocomplete()) will query the database and return the results. In the simplified version below, we do not describe the actual database query that may vary from structure to structure. The result returned is pretty simple and in our case we return 3 elements when 'image' option is declared: picture, name (made of different information) and id. $pic = "<img class='product_thumbnail' src='"
Feel free to add your comments or own experience.